In the Tender Light of a Fine Spring/Joyful!! English Title: In the Tender Light of a Fine Spring/Joyful!! 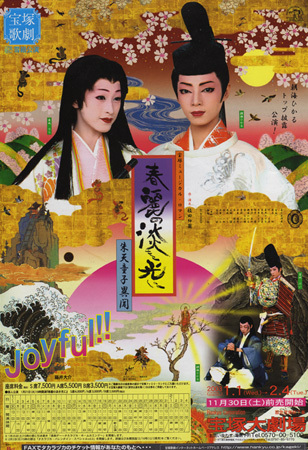 Romanized Title: Shunrei no Tanki no Hikari ni/Joyful!! Based On: "A Variant of the Legend of Shutendoji"
In the reign of Emperor Ichijo during which the Hokke branch of the Fujiwara family is at its zenith, a band of robbers are breaking into the houses of people having relations with the Hokke (north) branch. A leader of the robbers represents himself as Shutendoji disguising himself as a demon. Kaneie Fujiwara, Prime Minister and head of the Hokke branch, gives a splendid party to appreciate the cherry blossoms at his mansion. While he is enjoying a dance with his wife Kita-no-kata and younger sister, Mibu-no-naishi, he is told that Shutendoji and his band have broken into the premises. To Kaneie's face, Shutendoji says, "Fujiwara's regency and dictatorship shall not continue eternally", then runs away with his man Kidomaru disguising himself as a cowherd. Kaneie furiously shouts, "That is defiance against the Hokke branch of the Fujiwara family". He gives orders to hunt down Shutendoji to Tomochika Noyori, imperial police chief, who suspects Yasusuke Fujiwara of being Shutendoji. Kaneie's wife and younger sister alike insist that such a fine young man as Yasusuke cannot act like a demon. Tomochika feeling confident of his arrest of Yasusuke challenges the ladies by telling them that he has positive proof of Shutendoji's identity. Tomochika lays a trap for Shutendoji. On a clear starry night, Shutendoji and his men are caught in the trap and fight hard with policemen led by Tomochika. Shutendoji, in fact Yasusuke, fiercely crosses sword with Tomochika and has his left cheek deeply cut before running away. With the scar that certainly reveals Shutendoji's identity, Yasusuke cannot attend a Kyokusui party where guests make poems sitting beside a curved stream in the garden. As the last resort, he thinks out a plan to have himself replaced by his younger brother Yasumasa in Dazaifu (today's Fukuoka in Kyushu) who is his double. Yasumasa, who at first refuses to act as a substitute for his brother, determines to go to the Kyokusui party in his place in order to help him. On the day of the party, Kaneie and Tomochika expect Yasusuke any moment at the place of meeting. There comes "Yasusuke" without the scar on his left cheek which would identify him as Shutendoji. Kaneie is so enraged at the blunder that he dismisses Tomochika from the chieftainship on the spot. Kaneie now orders Yorimitsu Minamoto, chief of the imperial horse agency, and his younger brother Yorinobu, second secretary of the ministry of civil administration, to hunt down Shutendoji. Wakasa, Yorimitsu's younger sister, is in love with Yasusuke. She is present at the party in hopes of seeing Yasusuke whom she has lost sight of for some time until then. She sees through that he is not Yasusuke, saying that he can hoodwink all but a woman in love with the true Yaususke. Some days later, Yasusuke sees her and confesses that he is Shutendoji. He tells her that he has no choice but to live as Shutendoji, now that he has the ineffaceable scar on his left cheek. His choice means a long goodbye to her. Yorimitsu studied with Yasusuke at Kangakuin, private academy originally founded by Fuyutsugu Fujiwara for the education of the sons of the Fujiwara family. He still is friends with Yasusuke, and fully understands him. However, he has to hunt down Yasusuke as Shutendoji in compliance with the governmental order. Yorinobu considerate of his younger sister's anxiety invites Yasumasa to his house and inquires about his elder brother Yasusuke. Although he sympathizes with his brother, Yasumasa thinks Yasusuke should pay the penalty for his offences. Yasumasa asks Yorinobu to take him into his service because he himself wants to arrest his elder brother. In joining Yorinobu's service, he decides to abandon the surname of Fujiwara and to call himself Yasumasa Hirai. Yasusuke shows up before his men who are restless since the incident where their leader Shutendoji was injured. He tells them that he is going to kill himself in the cavern of Mount Oe and goes away. A few days later, Yorimitsu receives a letter from Shutendoji saying that he is in Mount Oe. Yorinobu starts with Wakasa for Mount Oe, where he plans to ask Yasusuke to run away with her. At about the same moment, Yorimitsu heads for Mount Oe with his troop and Yasumasa. Six gods each representing a sax, guitar, trumpet, contrabass, piano, and drum appear from nowhere to get together. After tuning, they marvelously sing a cappella. Then the music starts. New Conductor shows up on the front bridge. New Conductor sings out in ballad the commencement of a new show, birth of a new life, and excitement. Instruments in black tailcoats vigorously sing the gospel-like theme song. New Conductor first dances with men, and then with Woman S in duet. Women in tailcoats join them and all the performers energetically dance together. Maestoso in gold appears. He dances on the front bridge as he sings the theme song. Chorus line including the musical gods fill the stage. Maestoso and Muse beautifully sing in duet. The musical gods perform a dance in the ballet style with the musical god of piano in their center. A musical genius shows up and sings. Contessa and Aria are on the scene. When a musical genius woos her by playing the piano, piano-key-dancers jump out of the piano one after another just like his opuses. When the piano of decor opens up, modern musicians come out. They vividly dance with the piano-key-dancers into night. A supreme gigolo called Special Finger comes up with the wooden contrabass and sings blues to the contrabass. Special Finger sensually dances with women coming out of the contrabass. In Spain, Appassionato appears wellcome by the six musical gods and starts violently stepping the zapateado. Stars appear one after another, and sing modernly arranged famous Spanish tunes in medley. The incarnation begins to dance the zapateado calmly at first. Then it steps passionately with men coming on the scene one by one. The men vigorously dance with the incarnation in their center. Performers with shawls pompously march in parade. The incarnation of blood and Appassionato sensually dance the Spanish duet. After a performance of the musical gods, dancers in trousers with suspenders vividly and rhythmically dance. Comme ca, a traveler, sings his wish to meet people in a new town. Cuban men and women are passionately dancing at a plaza. A woman invites Comme ca to join them. When the rhythm changes, Cuban Venus turns up and bewitchingly sings as if she looked for a partner for the night. Although she is surrounded by many men, she invites Comme ca to dance with her. They enjoy a moment of dancing as a matured man and woman. However, they are separated by a wave of crowd. Cuban Venus is gone and Comme ca is left alone. He dances looking back upon the dreamy moment with Cuban Venus. The spirits of music appear and vividly dance expressing the joy of living. When Comme ca shows up in white, their dance reaches the zenith and evolves into a chorus line. When light focuses on Maestoso, he voices his joy with the expression: "Joyful, Joyful". The entire stage lights up again and gospels praising Maestoso are sung in chorus. Prince of Music magnificently dances with Princess of Music wearing a gorgeous veil. All the performers sing in medley as they vividly march in parade. The Tokyo performance was the final show for Kazami Yoshiki. The national tour was the final performance for Kazahaya Yuu. Created by jenebi. Last Modification: Monday 23 of June, 2014 20:23:09 PDT by KaleidoscopeKingdoms.